WHY IS IT SO HOT OUTSIDEEEE. Please tell me Kansas City’s not the only town sitting on the face of the SUN. It is crazy brutal right now. Heat indexes of five thousand. Humidity of 3 billion percent. Ozone layer on the verge on quitting its job it’s so pissed off. It is all I can do not to wedge my entire upper torso in our freezer and never come out for the rest of MY EXISTENCE. 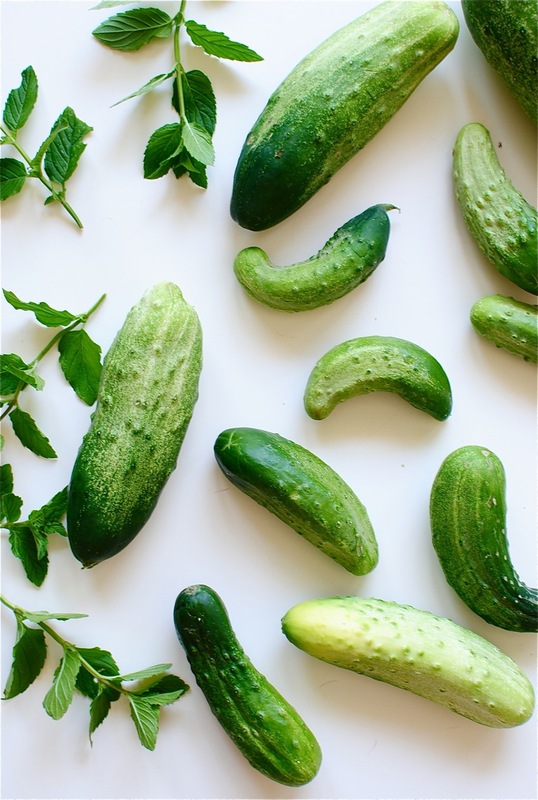 You know what they say, when life gives you cucumbers, you make cucumberade! Just kidding. This recipe is brilliantly simple. 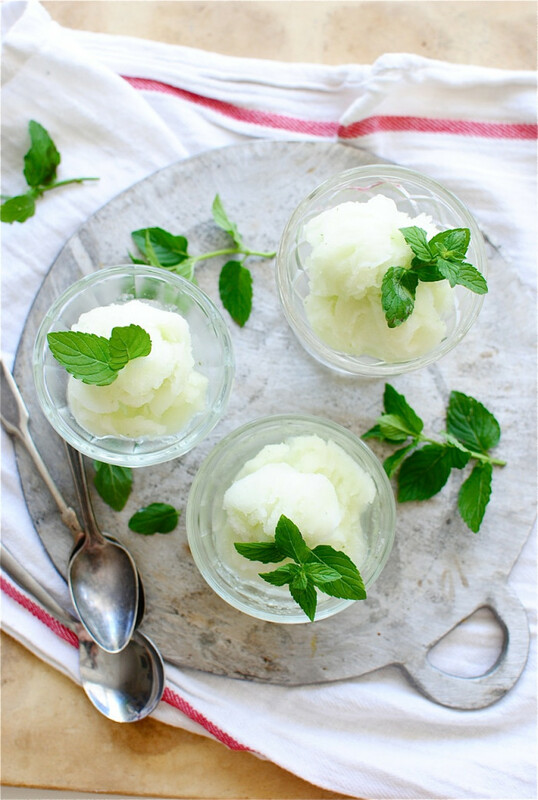 I looked up a basic sorbet-making method online, which is to make a simple syrup and add whatever whatever to it, and applied it to my birthing garden’s needs. You want me to stop saying birthing, don’t you? So this is what you’ll do. 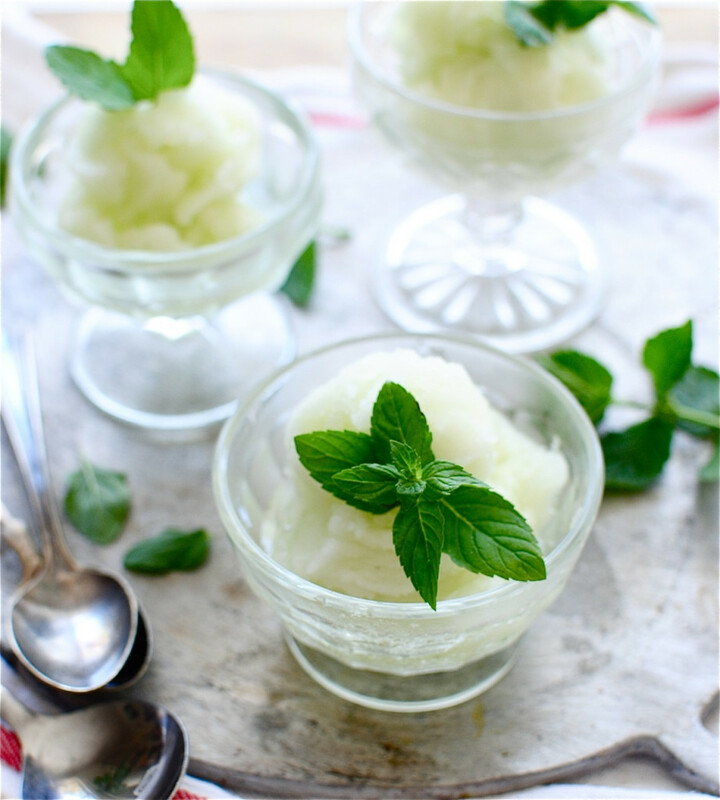 Puree some mint, diced cucumbers and a kiss of lemon juice in a food processor, add it to a (completely cooled down) simply syrup, and let the machine break a sweat for ya! It will churn and turn and churn and turn for less than an hour, creating a delightful, ice crystal-y, frozen treat just perfect for your burning-off face. And the mint? Takes it to a whooooole ‘nothah refreshing level, I tell you. In a medium sauce pan, bring the sugar and water to a boil. Stir on medium-high until the sugar dissolves, then reduce the heat to low and simmer for 3 to 5 minutes. Pour syrup into a bowl and let cool completely. While the syrup cools, peel and dice the cucumbers. 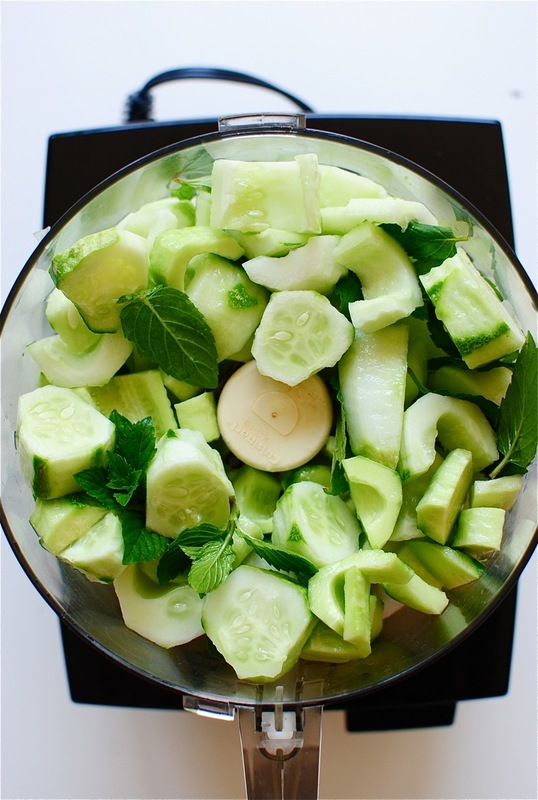 Place them in a large food processor, along with the mint leaves and lemon juice. Pulse until liquified. When the syrup has cooled, add the cucumber liquid to the bowl and stir to combine. Transfer mix to a VERY cold ice cream maker freezer bowl, turn on the machine and let it run for about 40 minutes, or until you get a smooth, icy sorbet consistency! Transfer bowl to the freezer until ready to devour. Garnish with mint leaves. Eat it all. What a great idea! I bet this is the most refreshing thing ever. And I also bet it would be great mixed into a cocktail with gin! OMG This looks scrumdilliocious! One of my friends dropped off cucumber soup last week and it totally saved me from losing it in this brutal heat. 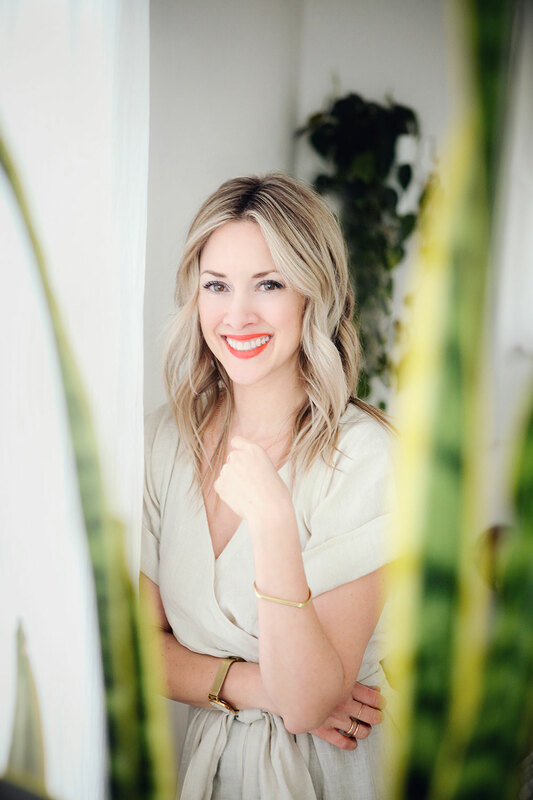 This post makes me want to run to the market now! YUMMY! This looks VERY refreshing and delicious. 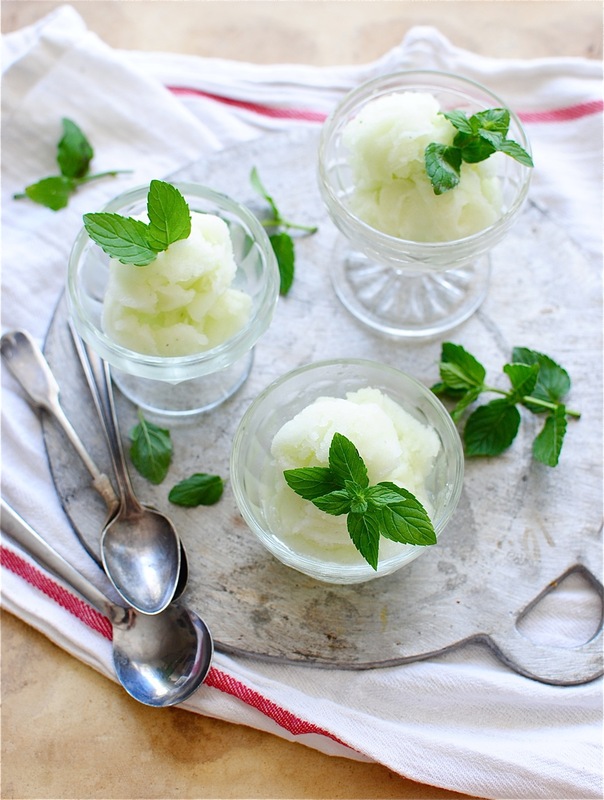 I love a good sorbet - but it's a shame I will have to wait until the winter is over here in Australia to enjoy it again! WoW! I've always though sorbet should be made only with fruits but seem refreshing! I'll definitely try it these days. Thanks for sharing! 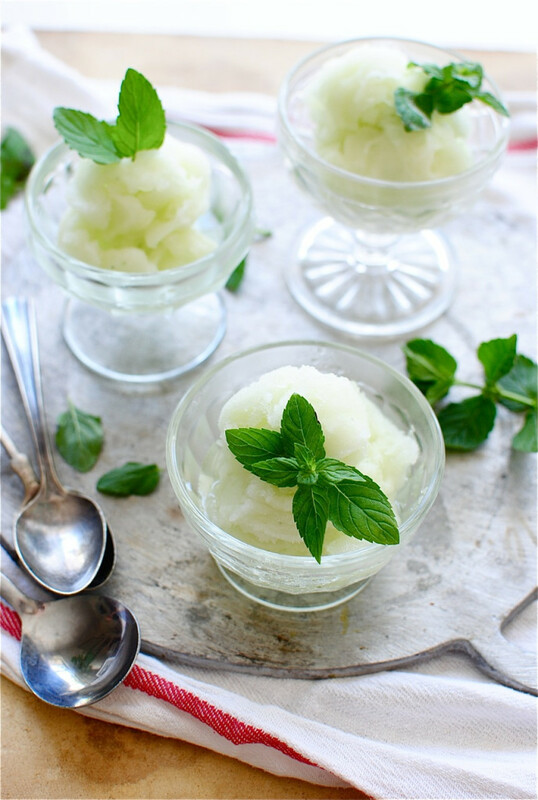 What's up,I check your blog named "Cucumber Mint Sorbet | Bev Cooks" on a regular basis.Your story-telling style is awesome, keep doing what you're doing! And you can look our website about proxy server list.